The alpine weather conditions create pleasant and mild weather conditions in summers from April to June, while winters from November to February are cold and experience heavy snowfall. The rainy seasons of July and August see a huge entourage of pilgrims who come here to visit the holy cave of Amarnath, the abode of Lord Shiva, as Pahalgam is the starting point of the famous Amarnath Yatra. 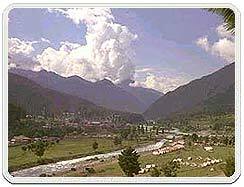 The mention of Pahalgam is found in the regions ruled by the Mughals in the medieval period. Local Hindu kings later ruled over it as a part of the Kingdom of Kashmir until this princely state annexed into India, after independence. 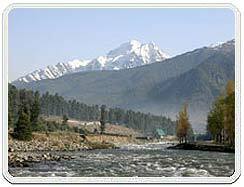 The natural beauty of Pahalgam and the luxuriant Liddar valley attracts the tourists. 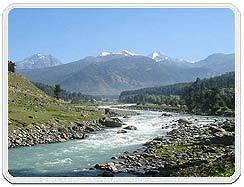 There are number of picnic spots on the shores of River Liddar, flowing near Pahalgam. Pahalgam is also a part of Asia's only saffron growing area; the saffron plants are in full bloom in November. Pahalgam offers quite a few hiking and trekking trails, which one can explore riding on horseback. Mamaleshwara Mamaleshwara is only a km or so downstream from Pahalgam, and on the opposite side of the Lidder, is this small Shiva temple with its square, stone tank. It is thought to date from the reign of king Jayasima in the 12th century, even earlier. Baisaran This meadow, about 5-km from Pahalgam and 150m higher, provides excellent views over the town and the Lidder valley. Pine forests and the snowclad mountains surround the grassy glen. One can hire ponies for this trek from near the centre of town. Tulian Lake If one continues 11-km beyond Baisaran one reaches the Tulian Lake at 3,353m, 1,200m higher up. It is covered in ice for much of the year and surrounded by peaks, which rise more than 300m above its shores. It also can be reached by pony trek. Aru The little village of Aru is actually the first stage from Pahalgam on the trek to Lidderwat and the Kolahoi glacier. It makes an interesting day walk from Pahalgam, following the Lidder river for Pahalgam, following the Lidder river for 11-km upstream. The main track, which also can be taken by car, is on the left bank of the river. There is also a less used, and more difficult path, on the right bank. At Aru one will often find the Gujars, living in their log huts with their flocks of sheep and goats, en route to the higher sheep and goats, en route to the higher pastures for the summer. Hajan Hajan, on the way to Chandanwari is an idyllic spot for a picnic. Filmgoers will recognize it instantly as it has been the location of several movie scenes. Chandanwari & Passage To The Amarnath Yatra Situated 16-km from Pahalgam, Chandanwari is the starting point of the Amarnath Yatra, which takes place every year in the month of Sawan (Rain). The destination is the Amarnath Cave, believed to the abode of Lord Shiva. Although the road from Pahalgam to Chandanwari is on fairly flat terrain, and can be undertaken by car, from Chandanwari onwards the track becomes much steeper, being accessible on foot or by pony. At this point the road fords, one route turning northeast to Pahalgam and two others southeast to Achabal and Kokarnag or to Verinag. The Jammu road leaves this route just before Anantnag at Khanabal. Anantnag has a number of sulphur springs, esteemed for their curative properties. The largest spring is believed to be the home of Ananta, the serpent on which Lord Vishnu reclines and from which the town takes its name - 'Abode of Ananta'. Ananta means 'endless' and the water issues from the base of a small hillock and rushes into another spring in the middle of which is a natural mineral deposit column which the locals revere as a lingam. On the 14th day of a full moon fortnight in September/October, there is a festival where the people fast and pour rice and milk into the spring to feed the goldfish. 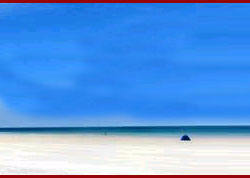 Air : The nearest airport is at Srinagar, which is 95 km from Pahalgam. This Airport is connected with all the major cities of India. Rail : The nearest Rail Head is at Jammu and from there National Highway NH1A connects the Kashmir valley with India. Road : It is well connected by road with Srinagar. The travel time between the two is 2� hours. Travelers can either use bus or taxi from Pahalgam to reach Srinagar. Tourists can hire guided ponies and horses to explore Pahalgam and the areas around it. There are numerous accommodation facilities in Pahalgam. The accommodations range from luxury to budget quality. A number of hotels and lodges cater to all preferences and budgets, from luxurious hotels to unpretentious trekkers' lodges, including J&K TDC's huts.